Many people when visiting the New Forest tend to stay within the historic central area where can be found the famous ancient woodlands, colourful heathlands and gravel-bottomed streams frequented by ponies, pigs, cattle and deer. And that's perhaps no surprise for these, after all, are what is expected of the traditional New Forest. Yet there's a different, equally attractive world out there, strung out along the National Park coastline, where the scenery is certainly impressive, the views rarely disappoint and the air is often bracing (but generally not too much so)! And the wildlife: wow, that's varied and in places absolutely abundant. Waders and wildfowl, for example, feed on the mudflats in huge numbers, particularly in winter. Spring and summer bring terns from afar to breed on these shores, and there's always a chance of seeing scarcer species like avocets and marsh harriers, too. 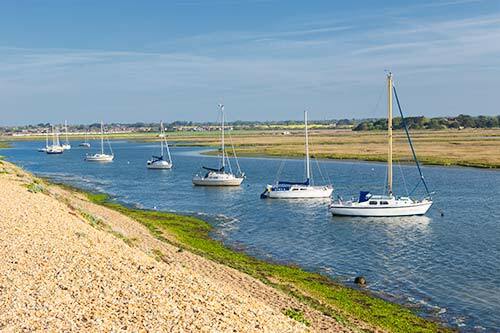 There is also much of historical interest to fascinate and intrigue, centuries-old fortifications such as Calshot Castle and Hurst Castle, the remains of aged salterns, and Buckland Rings, an Iron Age hill fort that dates back 2,000 years, and more. Don't forget to visit Lymington, either, where shops of all descriptions can be found and a bustling street market enjoyed. Pubs and restaurants offer varied fare amidst a wealth of splendid Georgian architecture, and the quay provides plentiful opportunities to sit and relax whilst watching the world go by. Here, then, are some of the coastal towns, villages and places of interest that will repay a visit with enjoyment on the day and a great many pleasant memories to store and take away. Not all are within the New Forest National Park boundary, but all are certainly worthy of inclusion.